If you are just getting started in the world of sports betting there are a few basic concepts that you need to know. You must be able to read odds and understand what they mean. Furthermore, you need to quickly calculate the potential winnings for different bets, especially if the odds are changing while the event unfolds. This is how you will be able to calculate a higher payout, which is the ultimate goal for any sports bettor. A very common example to explain odds is the flip a coin case. In such scenario the odds are equal, or one to one. Odds tell you the likelihood of an outcome. They represent which team, horse, or athlete has the highest probability of winning. While there are different ways to write odds, they all indicate how likely one outcome is in comparison to another. The most common use of odds is found when placing a bet on a sporting event. Bookies use historical data and team statistics to predict who is more likely to win. Now, a fundamental principle is that odds do change. Because circumstances may change spontaneously, odds may change as well. They are not an exact science. Once you are ready to start placing your bets consider that most new bettors tend to bet on favorites, simply because of a logical preference associated with who is more likely to win the game, depending on the sport that you bet remember that for your purposes, you don’t necessarily need anyone to win the game but win by a certain amount of goals or points, or to lose y not more than x amount. Betting on the underdog is riskier than betting on a favorite, but a higher risk means a potential higher payout. Note that there are different ways in which odds are shown. Sometimes you may see a whole number alone on an odds sheet, for example, instead of 3/5, the odds would be shown as 15 or 25. This is a decimal form of odds, as opposed to fractional. Multiplying your stake by decimal odds gives your total return, not your profit (which is total return -stake). To get to fractional from decimal, add 1. So 3/1 fractional = 4 decimal (just 4). 4/6 frac = (4/6+1) dec = 10/6 = 5/3, or 1.666, which is rounded to 1.67 by bookies. To go from decimal to fractional, subtract 1. So 15 dec = 14/1 frac. 2.33… dec = 1.33/1, or 133/100. 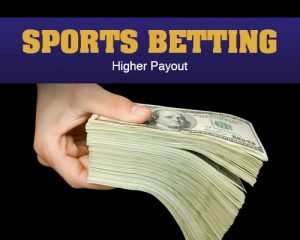 Learn more about sports betting, get in the action today at RegalPoker.com!